Pierre-Hugues Charbonneau (nickname P-H) is working for CGI Inc. Canada for the last 10 years as a senior IT consultant. His primary area of expertise is Java EE, middleware & JVM technologies. He is a specialist in production system troubleshooting, root cause analysis, middleware, JVM tuning, scalability and capacity improvement; including internal processes improvement for IT support teams. P-H is the principal author at Java EE Support Patterns. This article will teach you how to analyze a JVM Thread Dump and pinpoint the root cause of your problem(s). From my perspective, Thread Dump analysis is the most important skillset to master for any individual involved in Java EE production support. The amount of information that you can derive from Thread Dump snapshots is often much beyond than what you can think of. My goal is to share with you my knowledge on Thread Dump analysis that I accumulated over the last 10 years e.g. hundreds of Thread Dump analysis cycles with dozens of common problem patterns across many JVM versions and JVM vendors. Please bookmark this page and stay tuned for weekly articles. Please also feel free to share this Thread Dump training plan with your work colleagues and friends. Sounds good, I really need to improve my Thread Dump skills… so where do we start? What I’m proposing to you is a complete Thread Dump training plan. The following items will be covered. I will also provide you with real life Thread Dump examples that you can study and understand. I really hope this Thread Dump analysis training plan will be beneficial for you so please stay tuned for weekly updates and articles! But what if I still have questions or still struggling to understand these training articles? Can I send you my Thread Dump data from my production environment / servers? Yes, please feel free to send me your generated Thread Dump data via email or Root Cause Analysis forum if you wish to discuss the root cause of your problem(s). Real life Thread Dump analysis is always the best way to learn. I really hope that you will enjoy and share this Thread Dump analysis training plan. I will do my very best to provide you with quality material and answers to any question. Before going deeper into Thread Dump analysis and problem patterns, it is very important that you understand the fundamentals. The post will cover the basics and allow you to better your JVM and middleware interaction with your Java EE container. 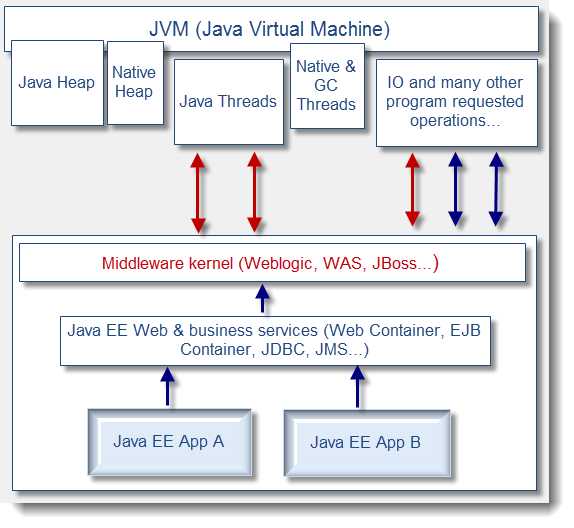 The Java virtual machine is really the foundation of any Java EE platform. This is where your middleware and applications are deployed and active. Your JVM can reside on many OS (Solaris, AIX, Windows etc.) and depending of your physical server specifications, you can install 1…n JVM processes per physical / virtual server. Find below a diagram showing you a high level interaction view between the JVM, middleware and application(s). This is showing you a typical and simple interaction diagram between the JVM, middleware and application. As you can see, the Threads allocation for a standard Java EE application are done mainly between the middleware kernel itself and JVM (there are some exceptions when application itself or some APIs create Threads directly but this is not common and must be done very carefully). Also, please note that certain Threads are managed internally within the JVM itself such as GC (garbage collection) Threads in order to handle concurrent garbage collections. Since most of the Thread allocations are done by the Java EE container, it is important that you understand and recognize the Thread Stack Trace and identify it properly from the Thread Dump data. This will allow you to understand quickly the type of request that the Java EE container is attempting to execute. From a Thread Dump analysis perspective, you will learn how to differentiate between the different Thread Pools found from the JVM and identify the request type. This last section will provide you with an overview of what is a JVM Thread Dump for the HotSpot VM and the different Threads that you will find. Detail for the IBM VM Thread Dump format will be provided in the part 4. Please note that you will find the Thread Dump sample used for this article from the root cause analysis forum. JVM Thread Dump – what is it? A JVM Thread Dump is a snapshot taken at a given time which provides you with a complete listing of all created Java Threads. As you can there are several pieces of information that you can find from a HotSpot VM Thread Dump. Some of these pieces will be more important than others depending of your problem pattern(problem patterns will be simulated and explained in future articles). This is basically the unique keyword that you will find in your middleware / standalong Java standard output log once you generate a Thread Dump (ex: via kill -3 <PID> for UNIX). This is the beginning of the Thread Dump snapshot data. This portion is the core of the Thread Dump and where you will typically spend most of your analysis time. The number of Threads found will depend on your middleware software that you use, third party libraries (that might have its own Threads) and your application (if creating any custom Thread, which is generally not a best practice). This is an internal Thread managed by the HotSpot VM in order to perform internal native operations. Typically you should not worry about this one unless you see high CPU(via Thread Dump & prstat / native Thread id correlation). When using HotSpot parallel GC (quite common these days when using multi physical cores hardware), the HotSpot VM create by default or as per your JVM tuning a certain # of GC Threads. These GC Threads allow the VM to perform its periodic GC cleanups in a parallel manner, leading to an overall reduction of the GC time; at the expense of increased CPU utilization. This is crucial data as well since when facing GC related problems such as excessive GC, memory leaks etc, you will be able to correlate any high CPU observed from the OS / Java process(es) with these Threads using their native id value (nid=0x3). You will learn how to identify and confirm this problem is future articles. JNI (Java Native Interface) global references are basically Object references from the native code to a Java object managed by the Java garbage collector. Its role is to prevent collection of an object that is still in use by native code but technically with no “live” references in the Java code. It is also important to keep an eye on JNI references in order to detect JNI related leaks. This can happen if you program use JNI directly or using third party tools like monitoring tools which are prone to native memory leaks. This data was added back to JDK 1 .6 and provides you with a short and fast view of your HotSpot Heap. I find it quite useful when troubleshooting GC related problems along with HIGH CPU since you get both Thread Dump & Java Heap in a single snapshot allowing you to determine (or to rule out) any pressure point in a particular Java Heap memory space along with current Thread computing currently being done at that time. As you can see in our sample Thread Dump, the Java Heap OldGen is maxed out! I hope this article has helped to understand the basic view of a HotSpot VM Thread Dump.The next article will provide you this same Thread Dump overview and breakdown for the IBM VM. Please feel free to post any comment or question. 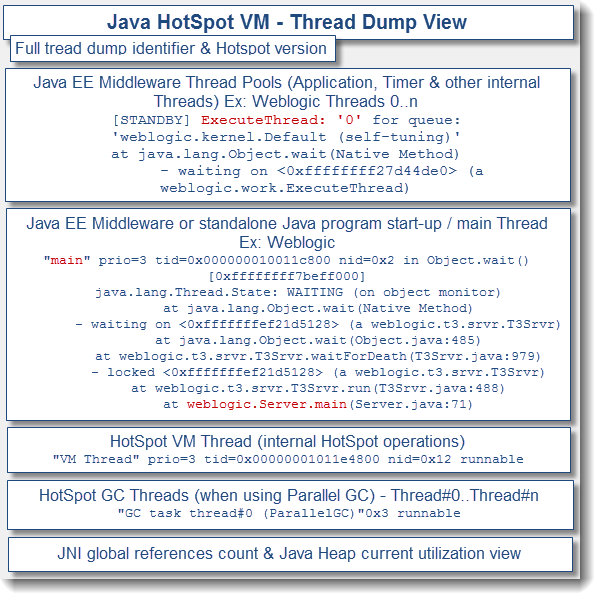 Reference: How to analyze Thread Dump – part 1, How to analyze Thread Dump – Part2: JVM Overview & How to analyze Thread Dump – Part 3: HotSpot VM from our JCG partner Pierre-Hugues Charbonneau at the Java EE Support Patterns & Java Tutorial blog. 21 Comments Views Tweet it! Hi, what are the links to the next articles? This “JVM: How to analyze Thread Dump” article of your is ridiculously similar to “How to Analyze Java Thread Dumps” http://www.cubrid.org/blog/dev-platform/how-to-analyze-java-thread-dumps/ published couple months ago by CUBRID developers on their official blog. I strongly believe these two should go together hand in hand as they mutually supportive. Great article, by the way! DId u find the solution to the above problem? Why do you write that creating custom threads is not best practice? Get frequently crash(Tomcat) problem. even after input enough RAM recently. i cross checked everything like Memory, CPU etc. Everything looks good. Moreover, i can see in Thread status there were some threads on “Waiting on Condition” some threads were “Blocked”. Could you please suggest me what excatly i need to investigate it over come this issue with “Waiting on Condition” and Blocked state. I came across Fastthread tool http://fastthread.io/ It parses complex thread dumps and presents with you with insightful metrics and beautiful graphs. About Java Thread dumps, http://fastthread.io/ is also good. It is free web tool. You have to upload your Thread dumps their server, and results are provided online.